I grew up in Washburn, Iowa, which is a small unincorporated town south of Waterloo. I was a first generation college student when I went to Iowa State beginning in 1980. I always wanted to be an artist since I was a child. I won first place in a drawing contest at my school “Immaculate Conception” in Gilbertville, Iowa when I was in the first grade. I got 25 cents in an envelope from a nun as my prize. We were asked to make a drawing promoting school lunch for the contest. I copied my sister’s drawing (she was in 3rd grade) of Charlie Brown eating from a lunch tray. I now live in Northfield, MN with my husband, David. We have lived in Northfield for less than two years. I am a Visiting Assistant Professor in the Department of Art and Art History at St. Olaf College. I am currently teaching drawing, painting, advanced drawing, figure drawing, senior studio, public art, etc. I also have a studio practice. My studio is in my home. When I was a kid my mom sewed our clothes. She made matching dresses for my sister and I. I remember one dress that she made for me from checked fabric. The hem of the skirt and sleeves had contrasting ric-rac. My mom enjoyed cross-stitching and working on painted “ceramics”. She was also my 4-H club leader. We learned how to make all sorts of things in 4-H such as a meal plan, a good snack, sewing, embroidery, knitting, and macrame. I learned in 4-H and from my mom that being creative is a part of everyday life. My friends in my artist’s’ critique group inspire me. Many of them have children, jobs, and make time for their studio practice. I have been meeting with this group of Twin Cities artists for about 10 years. We meet once a month to give feedback, learn and support one another. This group of women artists has helped me tremendously. 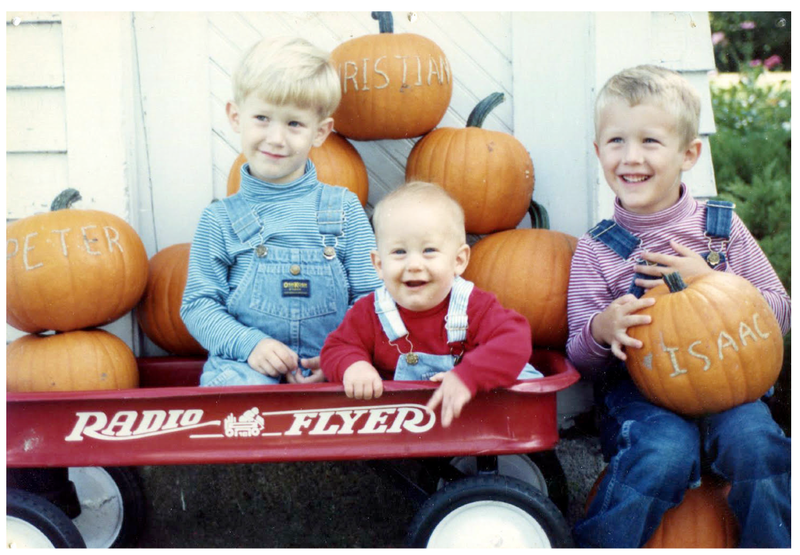 Photo of Peter, Christian, and Isaac in 1991. We lived in Big Bend, MN at the time in the church parsonage. Can you talk about how you balance your role of artist; and the role of mother? What was this like when your children were young? How has this changed as your children have ‘left the nest’? When my kids were young I had to have a lock on the studio door to protect my work and my kids from my materials. I find that I am just as “busy” now as I was when I had young kids. We all seem to fill our time. When my kids were very young I had studio time Monday through Friday from 6am-8am. David took care of the kids in the early morning before he went to work each day. That two hour block was a productive time because I am a morning person. Now I work on Monday, Wednesday, & Friday mornings from about 7-11AM. I teach on Tuesday & Thursday and do teaching prep and hold office hours in the afternoons on MWF. When my kids were young and also today I find that I have time to be an artist when I write down a weekly plan and stick to it. There are three aspects of my studio practice–creating, R & D (Research and Development), and business. I try to spend about 50% of my time creating, 25% on R & D, and 25% on business. I tend to procrastinate the business aspect a bit too much. I draw in the early morning before going to work at St. Olaf on Tuesdays and Thursdays. I usually just make quick sketches for a few minutes to record my ideas. I often draw in the car when I am not driving. I went on a long road trip this summer with my husband and one grown son. They both like driving so I had lots of time to make small drawings. I made about 30 drawings of things that I saw at gas stations–dumpster, signs, candy, newspapers, etc. Tell us about the Wheel within a Wheel series? How is it significant to you now? My series, A Wheel within a Wheel, centers around drawings of everyday objects in my garage combined these with text from the first chapter of Ezekiel in the Old Testament. Why would I combine this imagery with this text? 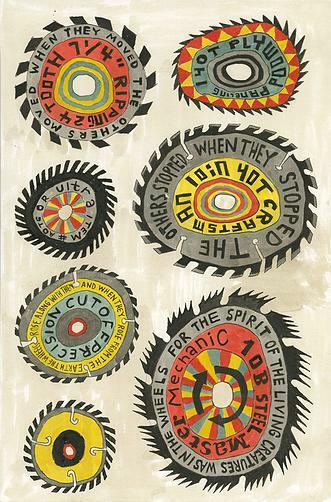 Ezekiel wrote about his vision of the heavenly world brought to earth in the form of spirit-animated wheels. My garage is filled with many ordinary wheeled objects. 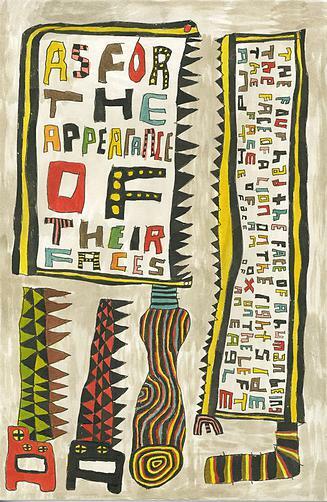 When I abstract the objects and combine them with text from Ezekiel’s vision, I aim to construct a visual metaphor of the sacred in the current time and place. I grew up in a small pink rambler in an unsophisticated rural Iowa town–Washburn. As an adult, I have lived in small outstate Minnesota towns most of my life, working as an adjunct art instructor. I am thankful for the life I lead, but like most people, my mundane existence sometimes causes me to question life’s meaning. In the past, people turned to religions to answer universal questions. I sometimes find sacred stories difficult to relate to, because they were written in a distant place and time and seem unbelievable to my contemporary mind. I have found that abstract visual art helps me see the metaphorical intersections of my culture, place, and time with ancient sacred stories. This photo was taken last week at St. Olaf. 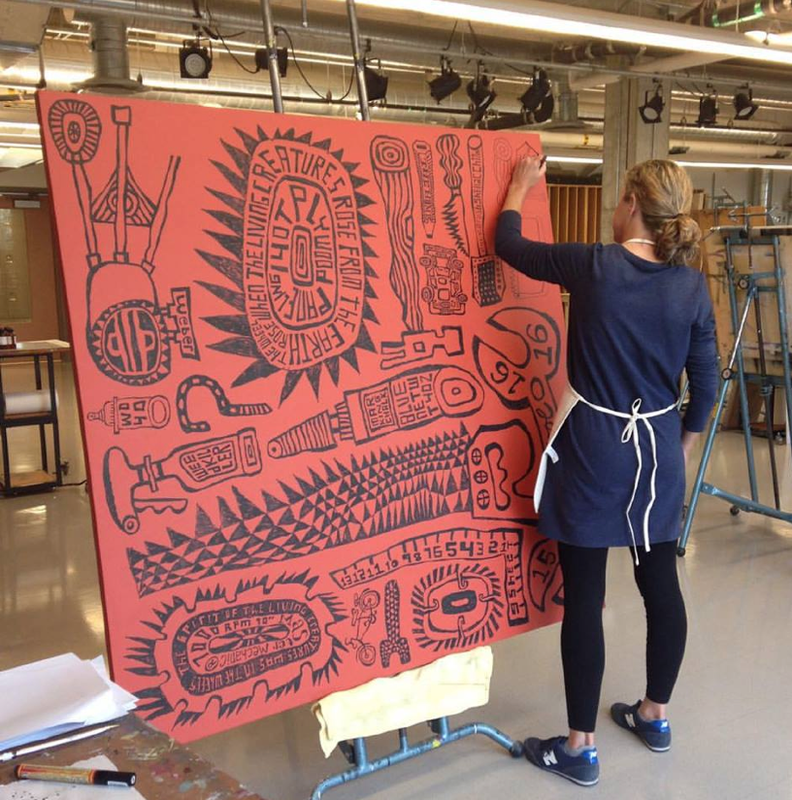 I am working on my new series of large paintings. I am working on three main projects. I am working on drawings to show in November and December at the Kiehle Gallery at St. Cloud State University. The drawings are mainly black and white and depict ordinary objects in my home. Today I made a drawing of an old piano solo trophy that belongs to my son Peter. The Walker Art Center has asked me to make a map-like drawing of current artwork in the galleries. The drawing will be printed on 11”x 17” paper and given to visitors on a Saturday in December. So next week I am going to the walker to do some drawing and research. I was recently awarded a grant from SEMAC which funds a new series of large-scale drawings of objects in my garage combined with text from Ezekiel’s vision of the wheel. I love to do things outdoors such as walking, running, biking, cross-country skiing, orienteering, canoeing, and camping. I am a slow runner, but I have completed several marathons. Marathon running has taught me discipline, the power of sticking to a plan, and confidence to go beyond my comfort zone–knowledge that helps me in the studio. l also sing in my church choir. I am not a great singer, but I find that singing and seeing the other altos each week brings me joy.